American Staffordshire Terrier Dogs - The American Staffordshire Terrier is a breed of dog. The breed is descended from American dog fighting breeds and was intended to be a show strain of the American Pit Bull Terrier. 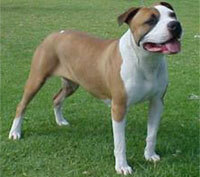 American Staffordshire Terriers were first recognized by the American Kennel Club in 1936. They are a member of the Terrier and Molosser groups. The dog is long muscular and strong, and gives the impression of great strength and agility for his size. These dogs should be courageous, tenacious, friendly, extremely attentive, and extraordinarily devoted. Originally an all-around farm dog, hunter, and family companion, American Staffordshire Terriers should be highly stable around both children and other domesticated animals (such as livestock). Their absorption into the abusive practise of dog fighting lends many a propensity toward dog/animal aggression; however, their adaptability, inherent friendliness, handler devotion, and fearlessness makes this an easy issue to correct, even in dogs that have previously been trained to fight. This information is licensed under the GNU Free Documentation License. It uses material from the American Staffordshire Terrier article on Wikipedia.org. American Staffordshire Terrier Breeders - Advertise your kennel puppies and dogs here.